"If you build it, they will come." Streetcar enthusiasts frequently say that all you have to do is put in public rail transit, and development will magically spring up around it. Prince Georges County outside of Washington, DC tried that. At great public expense they extended DC's Metrorail system, put in 15 stations, rezoned the surrounding areas for retail & dense housing, offered tax incentives, and waited for the money to start rolling in. And they waited...and waited...and waited..."Yet, the hoped-for uses and activities in areas surrounding the already-built stations have been slow to materialize." That's putting it kindly. Now they want to spend even more public money to study the notion of bringing in a pro soccer stadium. They hope it will attract people to use at least one of the empty stations. After the study they propose to spend even more public money to actually build the stadium. They have created a money-pit, and can't bring themselves to stop digging. Let's not make the same mistake with a Cincinnati streetcar. As you can see, the City of Cincinnati is about 2.5 times more dense than Prince George's County. Even Hamilton County as a whole is more dense than Prince George's County. You are also trying to compare the Metrorail, which is a commuter rail system, to the Cincinnati Streetcar, which is an urban circulator. What evidence is there to suggest that the Cincinnati Streetcar would turn out like the Metrorail extension, as opposed to the Portland, Tampa, Little Rock, or even Kenosha, Wisconsin streetcar systems, which have been successful? Real studies have been done to determine the actual ridership and economic impact of the system on our city. If you are going to suggest that the Cincinnati Streetcar will not be successful, why not analyze those studies and tell us specifically what they're getting wrong? I don't see how density ties-in with the supposed cause and effect relationship between rail transit and development. Perhaps you better explain that to me. They had real economic impact studies for the Metrorail extension too. 27,000 extra daily passenger boardings were predicted along with millions more square feet of office and thousands of additonal apartments. Since the $900 million extension opened in 2001, NONE of it has happened. It's becoming crystal clear that most of these studies aren't worth the paper they're printed on. So yes, we're going to have to do a whole lot more analysis before we commit our City to this mammoth Streetcar expenditure. The main reason for examining the Prince Georges case is that it offers an unclouded before and after comparison of development where rail transit was the only variable. The other cities you mention all had undertaken millions or billions in other (non-transportation) development initiatives. Streetcars came into the picture a couple years later, and are routinely credited with causing all that development. It's beginning to look as though the credit is misplaced. Have you been to Prince George's County and actually seen first-hand what it is you're writing about? 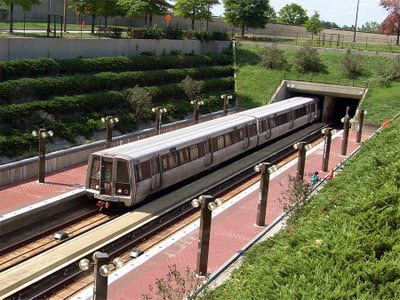 I have been to D.C. and seen/experienced first-hand the wildly successful Metro system that was at first thought to be a "boondoggle." Not only has Metro spurred economic development, but it has saved the D.C. area from costly congestion and damaging pollution and wear on its historic urban fabric. In terms of this particular case you present I'm not exactly sure you can take one example and extend it as being fact (like your title suggests...why the continued sensationalism from COAST?). "Metro and local government officials said the subway system's arrival could change that. After all, said Prince George's County Council Chairman Ronald V. Russell (D-Mitchellville), the corridor between Rosslyn and Ballston in Arlington was also a string of pawnshops and old shopping malls until Metro opened four stations in the area and it was reborn as a thriving commercial hub." Once again, your headline screams sensationalism as it doesn't have the facts to back up the hype. Maybe something like, "Not all transit systems created equal when it comes to spurring economic development." I've seen the mega projects to spur from MARTA in Atlanta around the Lindburgh and North Springs stations. Not every station sees the same level of investment, but the investment does occur on an overall basis. The market tends to determine where it occurs along those determined lines. I don't see how density ties-in with the supposed cause and effect relationship between rail transit and development. Perhaps you better explain that to me." Mark, I don't see how a 15 station metro rail system ties-in with the idea to build a streetcar system in Cincinnati. The two plans are such vastly different ideas that it's not really a fair comparison at all. Maybe you should go to your refrigerator, pull out an apple and and an orange and try to convince us that they're the same thing. You know, I thought C.O.A.S.T. was trying to put a measure on the ballot allowing people to vote to allow the streetcar...didn't think they were trying to oppose it. Even your representative Jason Gloyd went on air saying he wasn't opposing it...yet here on your blog and on your website you're blatantly opposing the streetcar. It's sad, is C.O.A.S.T. really fooling anyone? I lived in the DC area for about 5 years ('97-'01). While I haven't studied the PG County Metro station issue specifically, my analogy to this region would be if you had a commuter rail system that already connected all the rapidly growing areas of West Chester, Clermont, and Northern Kentucky to the core and then built an extension to Indiana and assumed that the same growth and density would occur there as well. PG County has always lagged behind Montgomery, Arlington, and Fairfax Counties in terms of growth. Besides the fact that, as others have pointed out, you are comparing an urban circulator to a suburban-oriented commuter rail, I think using this one example as a proof is inappropriate. Within DC alone, every other Metrorail extension (both red lines in MD and the orange, yellow, and blue lines in VA) has been hugely successful in terms of generating station area development and ridership. You're right that just because some academic with a bunch of letters after his name says something will happen, doesn't mean it will. Such studies should be scrutinized and debated, but the fact that they got it wrong once, doesn't invalidate the five times they got it right. You've convinced me that a Metro-rail is a bad idea for Cincinnati. But I still think a streetcar is a good idea. But you are right about one thing, the streetcar itself won't increase development. Its a piece of the puzzle, the Banks, newly energized OTR, Fountain Square. The streetcar will reinforce the momentum already created downtown.